Spearheading Financial Literacy the ELEARNMARKET.COM WAY !!! Elearnmarket.com (ELM) seems to be quite a unique business venture. What motivated you to come up with an online portal, especially dedicated to financial aspects? Well, our experience and expertise in the field of financial markets, learning management systems, visualization of learning tools and most importantly our passion for spreading financial literacy makes us the perfect team to take this product to the global scale. E-Learn markets signifies learn markets (financial) online. This was our thought at the time we started. However, post that, it pivoted to financial literacy theme. ELM has been recently launched in 2015. How is the overall response of the portal that you have received? The overall response of the portal has been tremendous! Elearnmarkets was launched just over a year ago, and today it has helped more than 20,000 registered users and 900+ premium users to learn from the 80+ courses that it offers in English, Hindi and other vernacular languages. It provides the learners with the option to choose from multiple learning formats like Live-Interactive Program and Instructor-Led Recorded Programs which are constantly being enhanced through, regular webinars and various online financial tools including learning games. What are your views about LiveInteractive Program and InstructorLed Recorded Programs offered by ELM, being at par or better than the classroom teaching? Live-Interactive Program and InstructorLed Recorded Program are way more effective than classroom teaching for various reasons. In today’s world technology is more engaging as compared to a typical classroom teacher. In this program, the students can use the convenient environment of the virtual world to learn without being confined within the bounds of classrooms. The biggest advantage of the program is that, they are open 24×7, hence making education available anytime and anywhere. Further, the students can study at their own pace because the course materials are available online. 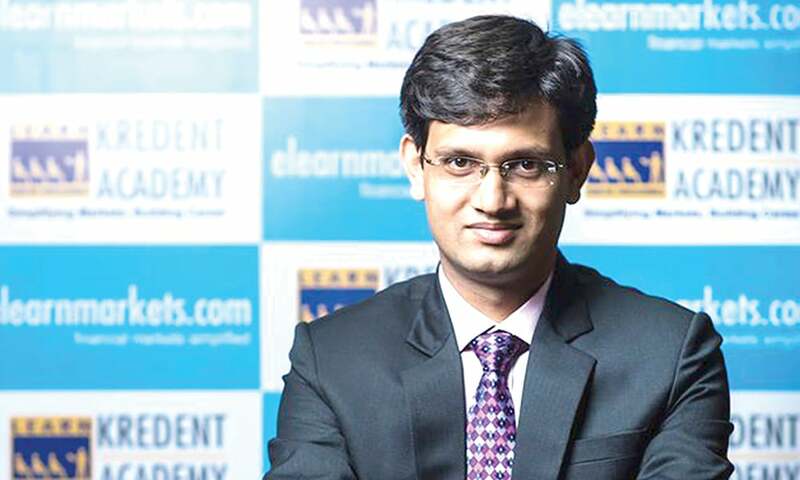 ELM has recently started an online Joint Certification Program on capital Markets, along with National Stock Exchange (NSE) of India. What do you foresee from this venture? We initially started with one course and then NSE gave us a mandate of 10. So as of now, we have 10 NSE certified courses on Elearnmarkets.com. Apart from this, we have recently signed an MoU with MCX for introducing courses on the commodity markets in the near future. Location is an important factor for the success of any venture. What are your views about Kolkata as the hub of your biz venture? We have been fortunate to spot the right kind of people in Kolkata and we have an amazing team today. Moreover since we are an online educational platform, the opportunities have never been limited. According to Arun Mitra, the current Finance, Commerce & Industries Minister of the Indian state of West Bengal, the state has attracted over Rs 83,000 crore of investments, including from leading corporate, during the last four and half years and we can hope for better business prospects in the near future. ELM is considered as the Creator and Curator of Financial Market Courses. How far is this justified by your brand? We provide a platform for finance experts to host their live or recorded courses on ELM on a revenue sharing arrangement. ELM enhances the learning outcome of each course by integrating topic specific Interactive Learning Tools for practical orientation and Market Simulators & Data Analytics for presenting real market scenario. Where do you see ELM in 5 years? What can you say about the other competitors in this segment? In 5 years – we want to become the Brand Ambassador of Financial Literacy and want to launch courses in other finance domains like Banking, Insurance, KPO, etc. We will also explore e-Learning opportunities in domains other than finance & financial markets. We strongly believe in co-opetition and not competition! Hence we are ready to collaborate with different education players, regulators, exchanges, brokers, Government and so on to spread financial literacy and financial education in developing nations, starting with India.